Boys Youth Long Jump Heats will be held at the 2 Mar 2013 morning, top 12 Finalist will be held at 2 Mar 2013 afternoon. 3 trials will be given to all participants for the heats, 3 trials will be given to top 12 finalist and additional 3 trials will be given to the top 8 results. Saturday Event 104 – Long Jump Qfy (Field Event – it is Qualifying NOT heats). Sunday Event 205 Discus – Boys Youth. It is held at 1pm, and not at 12 noon. There are events cancelled, please refer to the schedule for the updated timings. We would like to announce that we have closed the registration for the 2013 edition all-women Venus Run 5 kilometers run. The event has successfully reached our targeted quota and we would like to thank you all for the support. Participants please ensure that you pick up your Venus Run race pack collection. For race pack collection, please bring along your NRIC or photo ID for verification purpose. If you wish to authorise someone else to collect on your behalf, please download & fill up the authorisation form here (refer to PDF). For those who cannot come this weekend for collection, please see alternative schedule below. THERE WILL BE NO RACE PACK COLLECTION ON RACE DAY! Or you can alternatively pick it up on 2-3 March. City Square Mall is just located next to Farrer Park MRT Station. If you’re unable to collect on the above dates, here’s an alternate schedule. 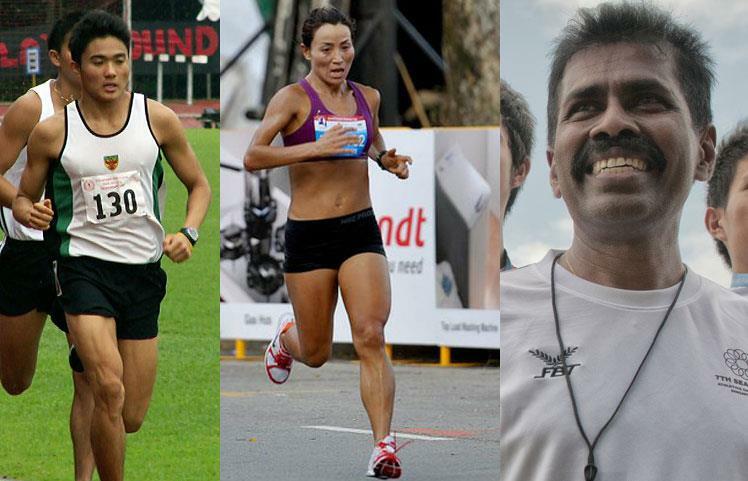 Singapore representative sanctioned by SAA at the Standard Chartered Hong Kong Marathon 2013 were Mok Ying Ren and Qi Hui. 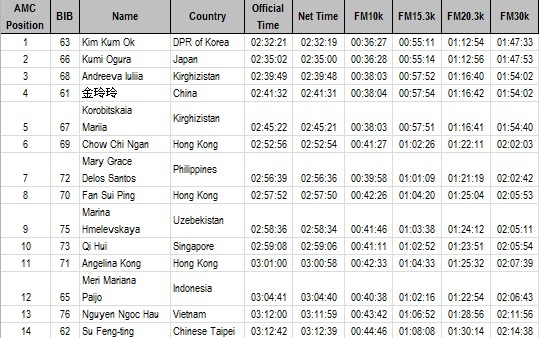 Below are their results from Hong Kong, where the SCHK also serves as the 14th Asian Marathon Championships. SAA’s Mr. Ghana Segaran, SAA Chairman of Cross Country & Road Running was also present who served as the Team Manager. 28th May – Day 1 and day 2 photos uploaded. 6th May – Videos uploaded. 19th April – Videos uploaded. 16th April – VoxSports coverage of the event. 14th April – Day 2 results uploaded. 13th April – Day 1 results uploaded. 10th April – There will be heats and final for 100m (35 – 39), (40 – 44), 400m (50 – 54) & There will be 2 flights for Men Javelin Throw and Shot Put. 10th April – Schedule updated. 10th April – Start list uploaded. 23rd February – Event page created. Registration is closed as of Friday, 22nd March 2013. Change of side column day from acronym to Mon, Tue, Wed, Thu, Fri, Sat & Sun for easy referencing. 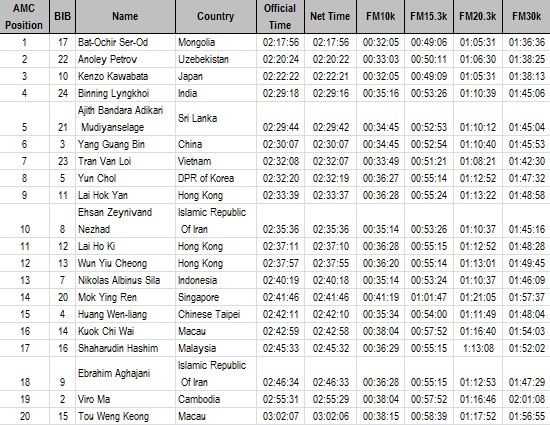 The below are Singapore All-Time List courtesy of ATFS and ASIAN AA Statistician Heinrich Hubbeling. You can help us by forwarding the correct date of birth, any typos made and corrections that need changing for this list. We are contactable at SAA.